(Bloomberg) -- The number of Chinese companies warning on earnings is turning into a flood, with no industry spared from worsening demand. Some 440 firms disclosed on Wednesday -- the day before a deadline to do so -- that their 2018 financial results deteriorated, according to data compiled by Bloomberg. Of the more than 2,400 mainland-listed firms that have announced preliminary numbers or issued guidance this season, some 373 said they’ll post a loss, the data show. About 86 percent of those were profitable in 2017. Damage was widespread: Airlines faced soaring fuel costs and a weak yuan, the equity-market slump hurt brokerages, while China’s economic slowdown and a surge in impairment costs slashed earnings for companies as varied as a bus manufacturer, a maker of refrigerators and an ID-card supplier. Conditions continued to get tougher in January for the smaller firms that form the backbone of the nation’s economy, government figures released Thursday showed. 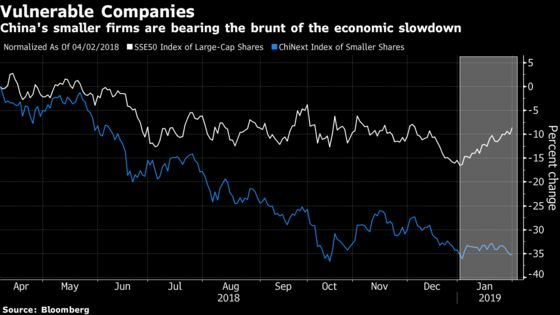 “We’re only just seeing the beginning of deterioration in corporate earnings as the economy slows further,” said Yu Dingheng, a fund manager at Shenzhen Flying Tiger Investment & Management Ltd. "Things will continue to go downhill for firms seeing business slowing and even as the macro-economy recovers, these individual firms will never be what they were." Another glut of earnings forecast cuts is likely before the end of the day, as many firms opt to take a hit from more stringent accounting rules rather than report years of losses. Among firms projecting a worse 2018 on Wednesday were Lens Technology Co., developer Oceanwide Holdings Co., chemical producer CEFC Anhui International Holding Co. and China Southern Airlines Co. Shares of all four companies fell onshore on Thursday. Chinese furniture maker Yihua Lifestyle Technology Co.’s 2020 notes sank on Wednesday to trade at less than half their face value. The company said about two weeks ago that its 2018 net profit likely fell 26 percent to 36 percent. Air conditioning producer Zhejiang Dun’an Artificial Environment Co. was put on negative watch on Wednesday by China Lianhe Credit Rating Co. after the company earlier this week revised its 2018 earnings to a loss from previous expectations of a profit. To be sure, some Chinese firms said last year’s results will be far better than expected: take Jiangxi Copper Co., WuXi AppTec Co. or Guangzhou Baiyunshan Pharmaceutical Holdings Co.
On Thursday, the first official gauge of China’s economy in 2019 showed that a slowdown across the manufacturing sector eased off a little in January, though uncertainty over the future of trade with the U.S. remains a headwind. A purchasing managers index for smaller manufacturers, however, signaled a deepening contraction. Little respite from the slowdown is expected before the second quarter, when companies will benefit from stimulus measures that should be fully kicking in by March, according to Morgan Stanley. Equity traders fled stocks in Shenzhen again on Thursday, sending the city’s benchmark down a fifth day. They’ve sought refuge in shares of state-controlled giants instead, betting that they’re better placed to benefit from the government’s efforts to support the economy. Shenzhen’s stock exchange is home to most of China’s start-ups and private companies.